So, as the first official day of NaNoWriMo draws to a close, with only an hour and a half left, my word count sits at 3007. Not bad, considering that I didn’t start writing until the middle of the afternoon. Oh, and I had a plot change. Again. I’m working on another CampNaNo project that I didn’t ever really work on. I think I wrote maybe about 150 words of this and then veered off into writing something with a set of my older characters. But while I was sitting with Scriviner open, trudging through the opening chapter of my chosen novel, I just couldn’t make the words come out. So I opened a new file, and started typing a random scene from the other story. And the words just came. So then I went and started writing the first part of the story, and now I’m at 3000 words. Maybe I’ll work on The Witch Queen’s War off and on throughout the month. Or maybe the Fantasy/ original world thing just isn’t for me. That’s entirely possible, I suppose, since this is the second time I’ve pretty much shelved this same story. Who knows, but, for now, I’m sticking with what works. And Shades in the Shadows is working for me, right now. Cover Image. The cover image for ‘The Witch Queen’s War’ was actually a retooling of this cover, not vice versa. I made this one back in June. 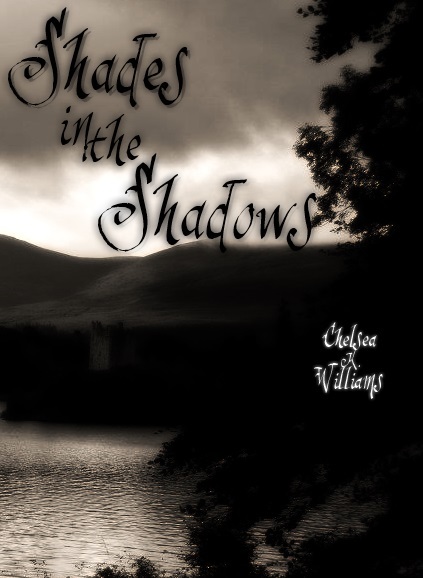 When Kaylee Sullivan is invited to join a college sponsored trip revolving around the restoration of a centuries old castle in the heart of Ireland, she immediately jumps at the chance. However, once the group arrives at the imposing Black Lake Castle, it doesn’t take long before some of them begin to have a few misgivings about the project. Soon, Kaylee and the rest of the group begin to notice odd occurrences. At first, they seem tame; cold drafts and odd noises, easily ignored or explained away. But as more time passes, things become more alarming and more frequent. Shadows seem to flicker in the mirrors followed by the sound of scratching at the glass. Nightmares plague the group, all centered around a dark an menacing human-like figure. Very quickly, what started out as a hands-on lesson in Irish history becomes a crash course in bone-chilling legends. When an accident inside the castle brings the restoration work to a grinding halt, the more superstitious minds among the group begin to point to the castle’s less than peaceful past. Murder, treachery, and a twisted fascination with the occult have tainted Black Lake’s ancient halls, weaving a warped history of cruelty, violence, and death. And now whatever sleeps within the many shadows seems to have awoken. Lesson of the Day: Go with whatever works! And what works is whatever gets you writing. And that’s where I’m at right now. Good luck to everybody participating in NaNo!